This self contained repair kit has silicon bands which strap and unstrap the kit. Easy to use - simply unstrap the kit, screw a CO2 cartridge on to the inflator head and push onto valve to inflate. Comes complete with tyre leavers. Perfect for any cyclist as it is small, light and portable. 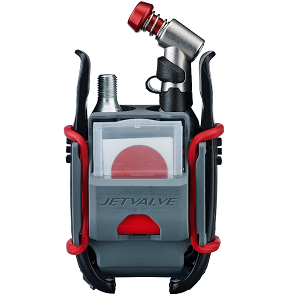 1 x JetValve inflator head. 2 x 16g CO2 cartridges.